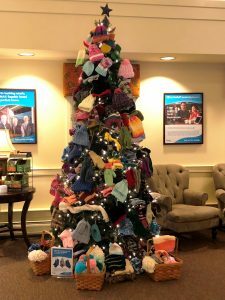 Community members supplied plenty of hand-made and store-purchased mittens, hats, gloves and scarves for mitten tree drive at MVSB and Merrimack offices. Sister Banks, Meredith Village Savings Bank (MVSB) and Merrimack County Savings Bank (the Merrimack), are grateful for members of the community who donated cold weather items to their annual Mitten Tree drives. More than 2,100 mittens, gloves, hats and scarves were collected and distributed to local schools and non-profits. In keeping with the tradition of contributing $2 for each item given, over $4,200 was donated to the NH Food Bank for use at food pantries in the Greater Concord, Nashua, Seacoast and Lakes Region areas. “The NH Food Bank works with food pantries in all of the regions that both banks serve. Contributions aid in decreasing the risk of food insecurity throughout our communities. I’m proud we were able to help in any way possible,” added Linda Lorden, President of the Merrimack. Meredith Village Savings Bank and Merrimack County Savings Bank are mutual community banks without stockholders. They have remained steadfast in fostering the economic health and well-being of the community for over 150 years, sharing in the values that guide all of their actions: accountability, mutuality, excellence, respect, integrity, teamwork and stewardship.